Originally published in 1948, this now-classic study by Merrill Tenney treats the Gospel of John as a literary unit and provides a straightforward analysis of the text. Tenney first outlines the structure of the Gospel, then offers a careful exposition of John's text according to six major periods of Christ's life, and finally presents a topical analysis of the Gospel. The result is not a critical commentary but a well-organized guidebook complemented by charts and diagrams. 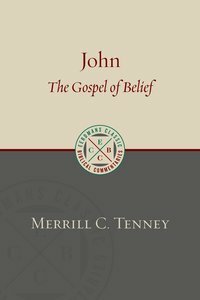 Tenney's John: The Gospel of Belief, reissued now in this new format, will continue helping pastors, teachers, students, and other Bible readers grasp the aim and major themes of John. About "John: The Gospel of Belief (Eerdmans Classic Biblical Commentaries Series)"
Merrill C. Tenny (m. 1985) era decano de la escuela de graduados y profesor de Biblia y teologia de "Wheaton College". Se graduo de "Gordon College" (Th.B. ), "Boston University" (A.M.) y "Harvard University" (Ph.D.). Escribio numerosos libros en ingles de los cuales han aparecido en castellano: "Diccionario manual de la Biblia", "Galatas: La carta de la libertad cristiana", " Quien manda en tu vida?" y "San Juan: El evangelio de fe".